Tickets for Samford University’s Step Sing 2017 show go on sale Friday, Jan. 27 at 9 a.m. CST. Tickets will be available for purchase online. Orchestra level tickets are $30, and balcony level tickets are $35. There will be four Step Sing performances at Leslie S. Wright Fine Arts Center. The performances will take place Feb. 9–11 at 7 p.m. and Feb. 11 at 2 p.m. A limited number of tickets will be available for the Saturday evening show. 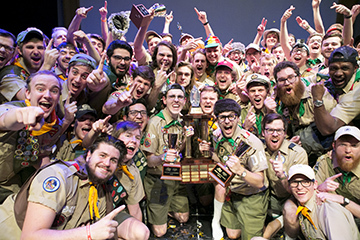 The Step Sing Sweepstakes Trophy will be presented after the Saturday evening show. Before Friday night’s show, the Office of Alumni Programs will host a reception, 5:30–7 p.m., in Jane H. Brock Recital Hall adjacent to Wright Center. Alumni can enjoy light appetizers, photos with the sweepstakes trophy, Step Sing memorabilia—including favorite costumes from years past—and the filming of the live stream countdown show. Those who cannot attend the performances will be able to live stream the Thursday, Friday and Saturday evening performances. A live stream countdown show will start at 6:30 p.m. for the Friday and Saturday evening performances. Step Sing is a 67-year tradition that started as a sing-along on the steps of Renfroe Hall at Howard College’s East Lake Campus in 1951. Today, students continue to gain an educational experience through arranging music, designing costumes and choreographing each unique Step Sing performance, according to Paige Acker, director of student activities and events. Erin Bognar is a journalism and mass communication major and a news and feature writer in the Division of Marking and Communication.